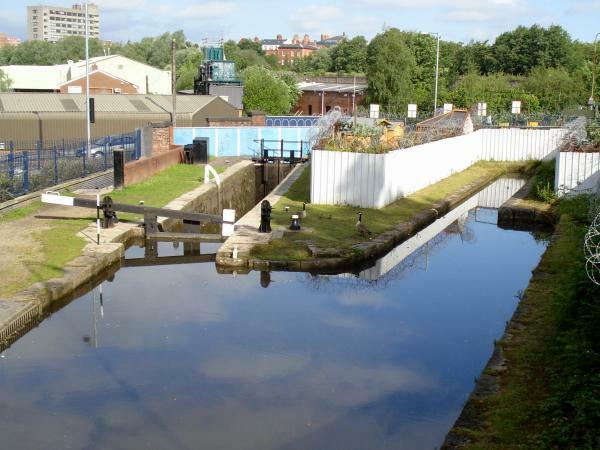 Whitelands Basin, Ashton under Lyne, the eastern terminus of the Ashton Canal. 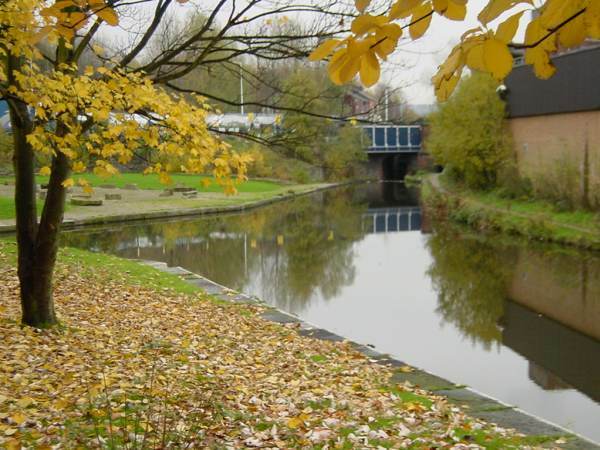 The Huddersfield Narrow Canal begins under Whitelands bridge, in the background. Whitelands Bridge at the start of the Huddersfield Narrow Canal. The gates of Lock 1W are visible immediately behind the bridge. 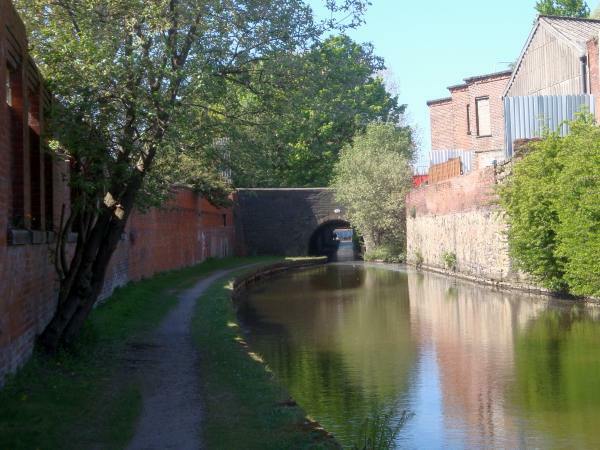 There is a separate horse tunnel alonside the canal bridge. Whitelands Bridge is an early example of a skew arch as the road crosses at an angle. When this bridge was built in around 1795, engineers were still trying to perfect the art of building skew bridges. 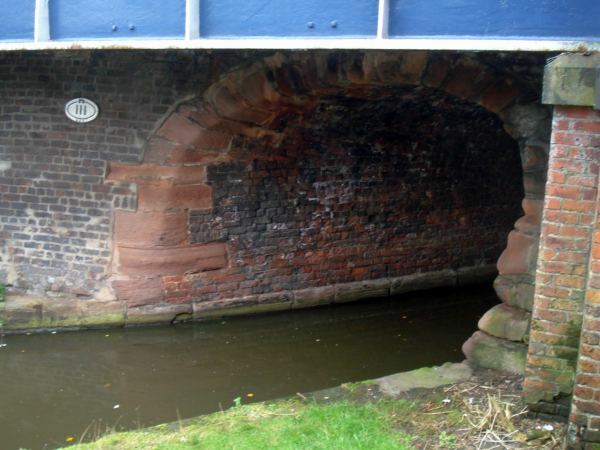 The courses of brick at the side of the bridge are horizontal, with a distinct boundary where they meet the bricks forming the roof arch, which are "winding courses" laid in a helicoidal fashion, perpendicular to the outside face of the bridge. Some of the photos here will explain this. 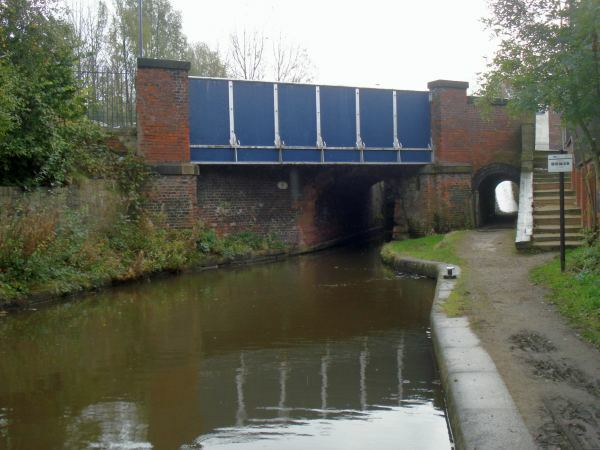 The first perfectly constructed skew bridge in the country, where all the bricks are laid in winding courses, with none laid horizontally, was built only a few miles away at March Barn Bridge on the Rochdale Canal in 1797. That design had a lot more strength than earlier attempts. 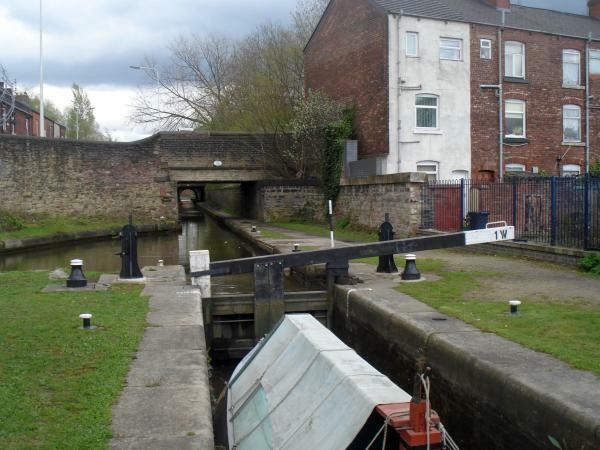 Lock 1w, immediately after the road bridge, seen here looking west from Whitelands Road, Ashton under Lyne. 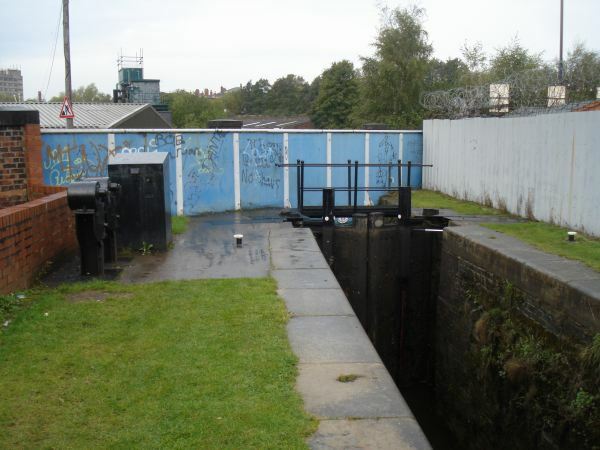 The locks on the Huddersfield Narrow Canal are numbered from each end. The lock numbers on the west side are followed by the letter "w", while those on the east side are followed by "e". There are 32 "w" locks and 42 "e" locks. A closer look at Lock 1w. At the time this photos wa taken the lock had no balance beams on its tail (downstream) gates, because the road bridge has been widened. The gates were operated hydraulically from the box on the left. These gates have now been replaced with gates with beams. 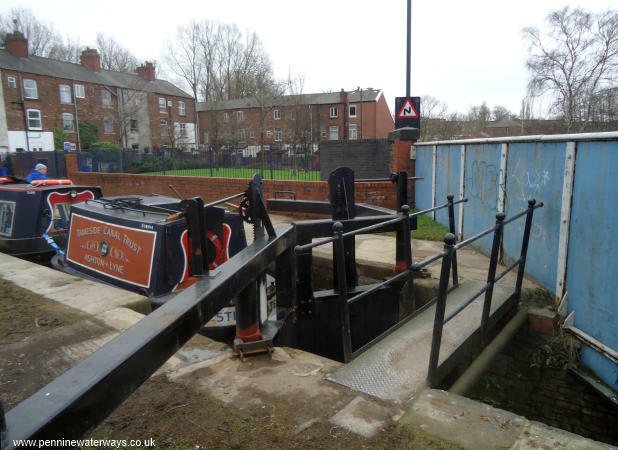 The new bottom gates at Lock 1w. The gate on the towpath side has a crooked beam because of the restricted space. Looking east from Lock 1W, along the narrow "Whitelands Tunnel", which was originally covered. Alongside the towpath are small bollards to which boats were tied while queuing for the lock, so that they would not be sucked forward as the lock filled. 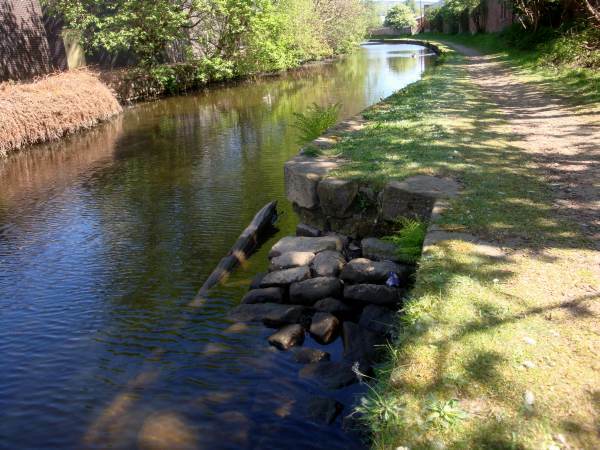 After "Whitelands Tunnel" the canal widens out. Looking back west towards Texas Street and Whitelands Tunnel. Looking east from Texas Street. 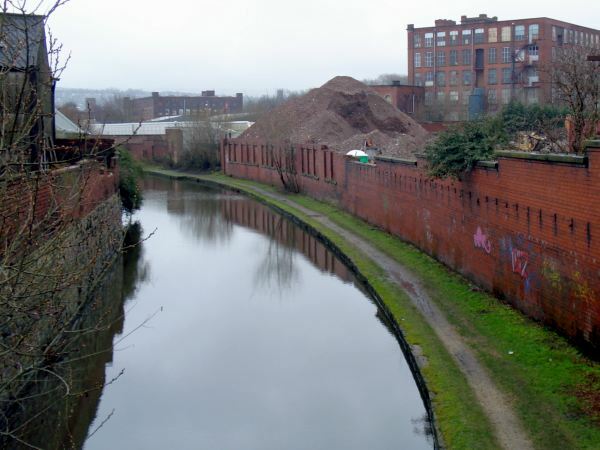 On the curve can be seen the remains of a horse ramp where any horses which had fallen into the canal in Whitelands Tunnel could be led back up to the towpath.